One of the more amazing (and least talked about) features of HTML5 is the concept of a canvas that you can draw on, much as an artist uses a canvas to create interesting pictures. I encountered an article about the HTML5 canvas the other day entitled, “All About HTML5 <canvas>” by Molly Holzschlag. In this article you get a great general overview of precisely what a canvas can do for you. I think you’ll find it quite useful, especially if your artistic skills are at the same level as mine are (nearly non-existent). The <canvas> tag makes it possible to create useful graphics in a way that most developers can understand quite easily. This is one tag that I wish I had explored more fully in my book, but picking topics carefully is part of being a good author. Instead of providing an overview like the one that Molly provided, I chose to include a more specific example that also employs the Google API. My Working with Data Using Maps post describes just one method of working with the Google APIs. Chapters 18 and 20 both discuss methods of working with the Google API and the example in Chapter 20 combines the Google API with the <canvas> to create an interesting example. If you’re working with HTML5 for the first time, make sure you spend time working with the <canvas> tag. It makes data presentation considerably easier, even if you lack artistic skills. Let me know about the projects you’ve created using the <canvas> tag at John@JohnMuellerBooks.com. Some time ago I provided some step-by-step instructions for creating both a Web Reference and a Service Reference in Visual Studio 2010 in the Adding a Web Reference in Visual Studio 2010 post. In addition, the post explains the difference between the two to make it easier to understand when to use one over the other. The post has proven popular and a number of people have commented on it. you find that the WSDL doesn’t contain the word Client either. 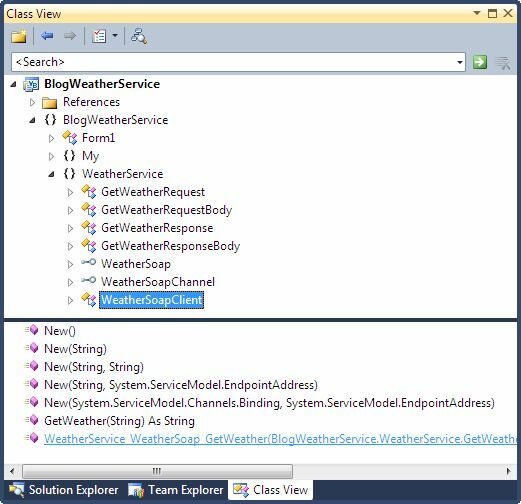 The WeatherServiceClient class is generated by Visual Studio in response to the WSDL it finds on that site. Another complaint about that original post is that it relies on C#. Just to make things different, this post uses Visual Basic instead. Creating the Service Reference works precisely the same as it does with C#. (The C# view of the dialog box is almost precisely the same.) What you’re seeing here is the result of creating the WeatherService Service Reference. I didn’t do anything else at all to this project. Highlighted in the upper window is the WeatherSoapClient referenced in my article. In the lower window you see the methods associated with that class.
' Create an instance of the Web service.
' Query the weather information.
' output the new information. As you can see, the code is similar to the C# version I provided in the previous post. The point is that you really do need to use the Class View at times to determine how to interact with a Web service after you create either a Web Reference or a Service Reference. My book, LINQ for Dummies, provides a lot more in the way of helpful information on using Web services effectively for queries. If you want a simpler view of Web services using the C# language, check out C# Design and Development instead. Now you know that the names used by other authors don’t come out of thin air either, even though it might seem that way at times. Please let me know if you have any other questions about this example at John@JohnMuellerBooks.com. You can use the Google API to create data presentations that convey information that is more than the sum of the individual data components. The presentation of data as part of a map tells the viewer more than what happened, how much happened, and where it occurred. A human viewer can often see patterns that aren’t part of the data by viewing that data on a map. The right map can make it possible to understand the data in ways that the data itself doesn’t allow. For example, you might determine that most of your business occurs near crowded intersections during the 5:00 rush hour. Extending what you have learned might make it possible to optimize store locations so that more people will be able to visit during times of peak sales. The creative presentation of data is important today because attention spans have grown ever shorter as more information sources clamor for a viewer’s attention. When you can make the data presentation interesting and also provide a means to derive more information than the information itself would tend to support, you have a winning presentation strategy. Maps provide such a strategy. Let me know your thoughts on data presentation at John@JohnMuellerBooks.com. A little over a month ago I wrote a post entitled, “Microsoft’s New Casablanca Release” about Microsoft’s newest Casablanca product. Niklas Gustafsson, a member of the Microsoft Visual C++ Team was kind enough to contact me and answer a few questions about this release. I decided that you also need to know the answers to these questions so that you can make an intelligent decision about Casablanca. As a quick recap, Casablanca is a new product that lets C++ developers interact with the cloud using REST. The first thing Niklas pointed out is that Casablanca isn’t precisely a product—it’s what is termed as an incubation effort, something to see what is possible and will work. Casablanca is early in its life cycle and doesn’t provide either the quality or maturity that a released product would provide. to me, this means that you need to be careful using Casablanca. For the time being, it’s probably an interesting technology to play with, but you probably shouldn’t employ it in your production application because it will change quite a lot. To make his point clearer, Niklas provided me with a link to a whitepaper entitled “C++ and Cloud Computing” that makes a number of points clear. I encourage you to download this whitepaper and give it a read before you make any decisions regarding C++ and the cloud. It certainly helped me envision how someone might use Casablanca a bit better. For example, even a low-level application could need access to an online storage provider in order to access the information it needs. I also hadn’t considered some special areas of program, such as gaming, when I wrote my original post—I was thinking more along the lines of what a business developer would need. With regard to my question about using REST, rather than SOAP, Niklas pointed out that REST currently enjoys far wider support than SOAP and that it’s simpler to implement. If Casablanca becomes a success, SOAP support could follow. So, at least the team is thinking about SOAP as a future addition. It’s also important to remember that many organizations are only starting to think about cloud computing, so technologies such as Casablanca are still well ahead of the curve. Sometimes in reading the technical articles online, you get the idea that cloud computing is already well entrenched in the enterprise. The truth is that many enterprises are only now experimenting with the cloud and some will never use the cloud due to regulatory or other concerns. I was really happy that Niklas took time out to contact me regarding Casablanca. I’ll be taking another look at this technology as the Visual C++ Team works on it and will likely provide you with an update sometime in the future. In the meantime, let me know how your organization is working in the cloud today at John@JohnMuellerBooks.com. When I wrote C++ All-In-One Desk Reference For Dummies, I provided the reader with a view of C++ as a low-level language. It’s true that most developers use C++ to create command line utilities, drivers, embedded systems, libraries, and even operating systems. While I might use C++ to create a database engine, I probably wouldn’t use it to create a database application. I’d probably lean toward some combination of a procedural language such as C# or Visual Basic and a declarative language such as SQL or LINQ for the purpose. I’ve written database applications using PHP, Java, and a host of other languages, but never in C++ because C++ isn’t the optimal tool for the job. Many developers have written about the strength of C++ being the flexibility it provides to perform amazing tasks. So, I was a bit surprised to learn that Microsoft has delivered a new product codenamed Casablanca that lets C++ developers interact with the cloud using REST. In reading the blog post announcing Casablanca, I detect a lack of direction. I understand that C++ currently lacks library support for any sort of Web service access without buying a separate third party product. However, that’s all that the blog post tells me. It doesn’t provide me with any ideas of how Microsoft sees the developer using this library. Given that some people do write C++ applications, I imagine that Microsoft envisions developers creating full-fledged applications with their product, but the intent is a mystery (and will remain so until someone at Microsoft speaks up). The last paragraph of the blog post says it all, ‘We would love to know whether you’re interested in using C++ to consume and implement cloud services, and if so, what kind of support you want in order to do so, whether “Casablanca” is on the right track, and how you’d like to see it evolve.’ Apparently, Microsoft is hoping that the development community will come up with some ideas on using this product. This means you can’t use Casablanca to create a library for all of those Windows XP users on your network. It doesn’t surprise me that Microsoft would place these platform limits on the product, but I’m wondering just how many developers will be able to use Casablanca in today’s enterprise environment for a product application. The fact that Microsoft’s Casablanca site heavily promotes its use with Azure leaves no doubt that this product is designed for the enterprise (or at least, a larger business). Another strange limitation is that the product only supports REST. At one time, Microsoft was promoting SOAP and many Web services still rely on this protocol. In fact, it’s actually easier to create a connection to a SOAP Web service in Visual Studio than it is to create a REST connection. I’m sure that Microsoft will address this limitation at some point, but for now, this remains a problem for developers. Casablanca does come with the usual Microsoft bells and whistles. If you buy the latest version of Visual Studio, you’ll obtain a complete set of templates that will make coding access to a REST Web service easier. I’m sure that there are developers who are working with just the supported platforms, work with Azure, and have the most recent version of Visual Studio who will absolutely love this product, but I have to wonder how many developers outside this small core group will be able to use Casablanca to do something productive. Normally, I try to find something positive to say about new product releases, but this one has me scratching my head. I’ve downloaded Casablanca and plan to play with it some more. If there are some truly dazzling features, I’ll post an updated blog entry later. In the meantime, I’d like to hear your input. Is Casablanca an amazing new product that C++ developers must have? If so, how do you plan to use it? Let me know at John@JohnMuellerBooks.com. A number of my books include Web service examples. It’s hard to write a book about any sort of development today and not include one or two Web service examples in it. In fact, some of my books, such as Start Here! Learn Microsoft Visual C# 2010 Programming contain a number of these examples. The reason is simple. Online services provide access to a wealth of information and can also reduce the programming burden on developers. Learning to use Web services provides a significant competitive advantage, so I need to discuss them in my books. Creating a useful and interesting Web service example in a book is a lot harder than you might think. It’s not as if my book is for a particular kind of reader or someone who is looking for a specific type of information. In addition, I need to consider the overall learning experience that the reader will receive from the example. With these criteria in mind, I ask myself the following questions when choosing a Web service for a book. Is it general enough to be appealing to my reader? Will the service be around tomorrow so that the reader doesn’t find a blank site? Does the service include a well-designed API that will make it easy for my reader to learn? Will the service be easy enough to use that the examples won’t become too complex? Use the book’s source code, rather than type the source in yourself. Look on my blog for updates for your book that show how to use any Web service updates. Check your Internet connection to ensure it’s active. Verify that the Web service is actually functional (and try back a few times, just in case). Contact the Web service owner with questions you have about it. Contact me at John@JohnMuellerBooks.com about example code that you simply can’t get to work. I want you to have a great experience using my books. When I do encounter a Web service that has changed or is no longer in service (it does happen), I’ll try to update my example code so you can continue using the book, as long as the book is still supported (please check the unsupported book list on my Web site).